The rich heritage of the great Russian artist, in whose work art and science are combined in an amazing way, for the first time was presented in the exposition of the non-governmental Museum named after N.K.Roerich, created by L.V.Shaposhnikova on the initiative of the younger son of Nicholas and Helena Roerich, Svyatoslav Nikolaevich. Over the 26 years of its existence, the Museum has become a real “Roerich’s Empire”. It was a source of enlightenment for contemporaries, truthfully and fully telling about the life and activities of the great family, about the Teaching of Living Ethics – the philosophy of the Cosmic Reality, which underlies the work of all Roerichs. The Museum’s exposition was ruthlessly destroyed in 2017. Those who were obliged to defend and support the Museum in office – the Minister of Culture Medinskij with his deputies and the leadership of the State Museum of Oriental Art – became destroyers. It was them who destroyed and devastated the “Roerich Empire”, wanting to completely remove from people’s memory the non-governmental museum created by the people. Next year, in 2019, we will celebrate the 145th anniversary of the birth of the great artist. The International Centre of the Roerichs (ICR) is preparing to celebrate this date with the creation of the non-governmental N.K.Roerich Virtual Museum. The museum will remain faithful to the tradition of openness and accessibility: the Roerich legacy will be presented in all its richness and diversity. Today, on Nicholas Konstantinovich’s Memorial Day, the ICR presents the first stage of the Virtual Museum to the admirers of Roerichs’ work: a virtual tour of the museum exposition, as it existed before its barbaric destruction, and a chronicle of the capture and destruction of the non-governmental Museum. “The destruction of a Museum means the destruction of the country,” Roerich wrote these words, deeply believing in the high purpose of the museums and their leading role in the preservation and development of culture. 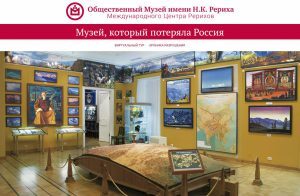 The purpose of the virtual Museum is not only to preserve the non-governmental Museum with its beautiful exposition in memory, but also to express confidence that one day the N.K.Roerich Museum will be revived to life again to open its doors to all those who wish to join the wonderful world of the Roerichs – outstanding compatriots who worked for Russia and believed in its great future. ← THE ROERICHS’ HERITAGE IS IN DANGER!